How abortion pills became the safest way of terminating a pregnancy? After the various struggles that have been done by the pro-choice groups, regarding allowing women to get an abortion according to their own decisions, many countries have allowed abortion with the help of FDA approved pills mifepristone and misoprostol. These pills are endorsed to be safe and can be taken at home and so few places allow to buy abortion pills over the counter. Research says that women having an abortion at home are having a higher frequency and that only 2% of women turn out to the health clinic to tackle the aggravations created from the use of the termination pills. How did the abortion pills originate? In the year 1980, a French chemist Georges Teutsch on a formal research developed mifepristone (RU486) which is also a progesterone receptor antagonist. In October 1981 tests were conducted on 11 women at a medical hospital in Switzerland that stood to be successful. Later in the year, 1987 October mifepristone was taken with a prostaglandin analog misoprostol and the research was conducted on 20,000 women which was again a successful attempt. After this Roussel Uclaf got approval to allow the use of these misogyne pills to be used as the termination pill to induce abortion. This was later accepted by WHO in the year 2000 and approved to be the safest mode of inducing abortion. Great Britain approved the use of these abortion pills in the year 1991 1st July while Sweden accepted the use of misogyne in the year 1992 September. These pills have been included in the world health organization essential medicines for health benefits. What made women prefer pregnancy termination pills? Termination pills are the most preferred pill as these pills have the simplest guidelines for its use, it doesn’t require to be taken in presence of any healthcare provider while when the society still stigmatizes about the issue of abortion this can be taken in secrecy and privacy. The basic ingestion procedure of these pills is so simple that it can be taken easily with a glass of water without involving into much sophistication. How safe are the abortion pills? These pills are supposed to be the safest but it includes a few side-effects. Like we all know any kind of abortion will lead to vaginal bleeding and abdominal pain. In case of abortion pills, these problems are more intense as in when compared to other forms of abortion women have to face more bleeding and more abdominal cramps in case of abortion pills. The intensity of the bleeding varies depending upon the women’s gestation period. If the days have extended to 7 weeks or above the bleeding will be more as by now the endometrium has thickened and shed the entire pregnancy tissue includes lots of bleeding. 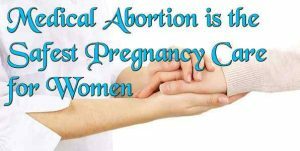 As we know that abortion with termination pills happen naturally hence the body changes accordingly to cause the abortion. In this case, the entire pregnancy tissue is washed away gradually while in other abortion cases the tissue is cleaned with the help of curette or forceps so that the bleeding faced is very little. But the surgical abortion involves the problem of scraping and anaesthesia that can lead to rupture of the uterus. So because of the easy availability of these pregnancy termination pills and its safe procedure, it is accepted worldwide as the best form of abortion method.